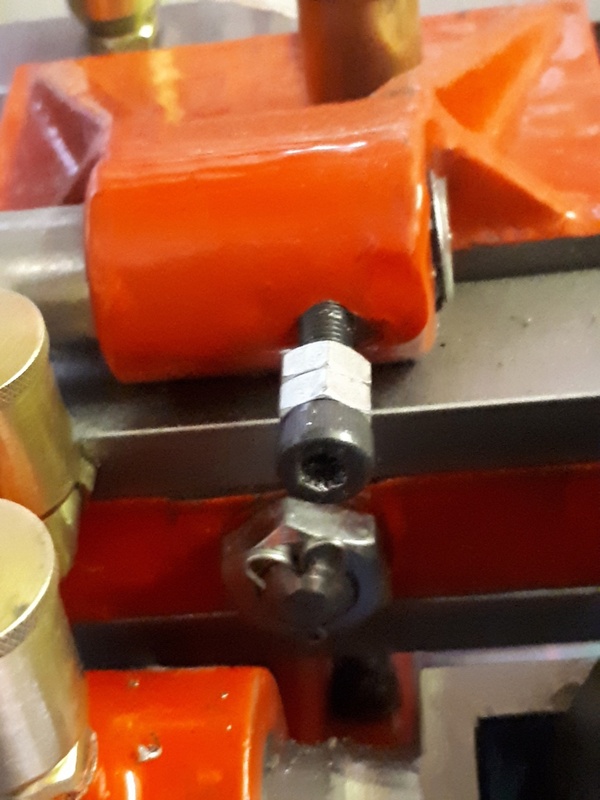 Steam Traction World :: Steam Traction World Update :: STW Owners SCC Burrell 4"
On my engine the grub screws holding the piston rods steady in the crosshead are always coming loose which allows a very slight amount of play and hence starts to make a knocking noise. Has anyone else had this issue? I have not tried Loctite on them yet as I fear I would never get them out again; they are so small and these hex head grub screws have a tendency to round off in my experience. Do you enough room to put a second grub screw in to lock the first? I was looking at that the other day. I don't like these small grub screws. They are too soft for starters. I was thinking of increasing them to M5 and using dog point grub screws. Once the crosshead as be re-tapped M5 the pistons and rods are refitted and set up. Then I was thinking of possibly taking a M5 hex bolt and bore it to the diameter of the dog point. This will be used as jig for drilling the piston rod to suit the dog point. What's your thoughts. May be a bit over the top but at least there's no fear of the piston rod turning. I have the same problems Chris, the grub screw came out completely at the last rally. I have tried Loctite again but it doesn't appear to be a good solution. At the moment i'm just checking it regularly when in steam and carrying spare grub screws! Go for stainless steel grub screws and fit two short ones. Locktiting grubscrews can be a problem when removing them especially with cheap allen keys as they round off. I found it was worth investing in a decent set of allen keys. Just thought of another answer. This is a bit simplier. 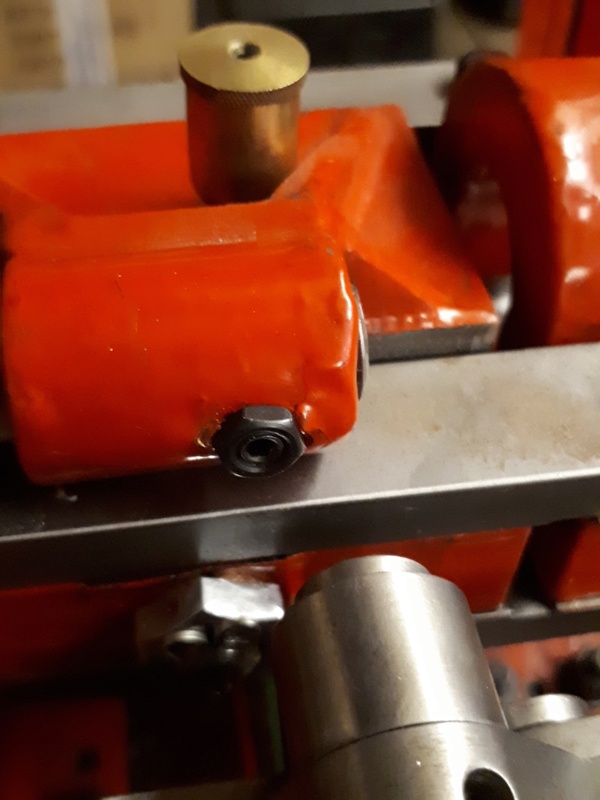 Put in a longer grub screw in, say 10mm and do up a locknut on top. That should take care of the vibration. should now cover all bases. Thanks for the suggestions! I might have some extra short ones around to try putting one on top of the other but if not Jim your suggestion of a longer one with a nut sounds good too. If the head of the first gets damaged by the second there could be a problem getting if out. Also definitely don't use loctite as you'll have no chance. put a little steam seal graphite paste down the hole after you have tightened of the grub. The heat from the engine will cure the paste solid but if you need to remove the grub you can carefully dig the steam seal out. it will give enough resistance to stop the grub coming loose but not to much that you cant remove it. 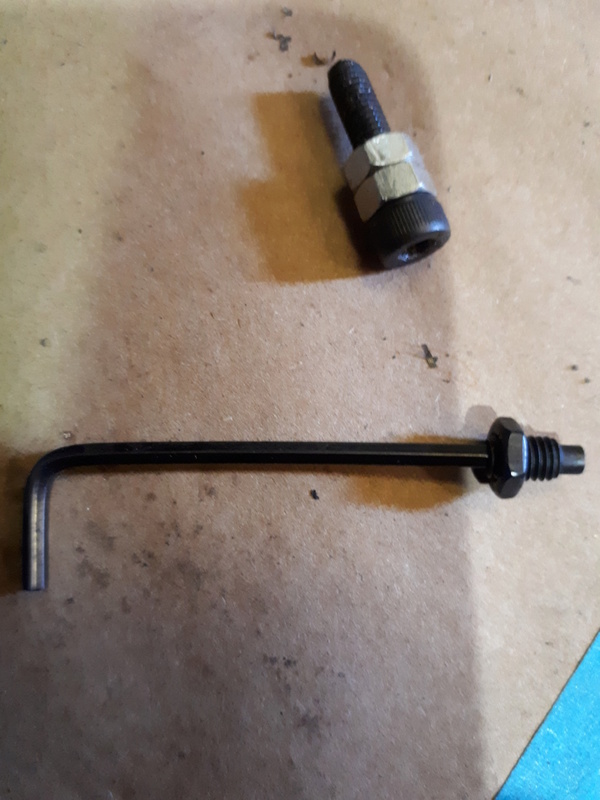 OK so I ended up using a normal hex headed bolt with a locking nut on the right hand side, and two grub screws, the outer with a very thin locking nut on the left hand side. I was planning to just use the bolt and locking nut on both sides but clearance is restricted on the left due to proximity with the oiler. We shall see what works. I re-tapped the cross head M5 last night and drilled 3.5mm through a M5 bolt last night in readiness. The M5 x 10mm dog point grub screws arrived this morning so am now ready for the modification. My engine is not up and running as yet but hope to run on air this week. Will keep you posted with how I get on. The M5 grub screw certainly looks a lot better. I've finally done it. Had previously increased the thread size to M5. Now that I'm satisfied with the piston rod set up it's time to drill for the dog point grub screw. Had to make another jig for drilling this time using a cap head. Better grade bolt. With 3.5mm drill, drilled through the jig and into the piston rod the length of the dog point. The M5 x 10mm dog point is just long enough to add a half nut so it can be locked in. There we go all done and dusted. No Loctite, No load on the grub screw and piston rod locked in position. Best bit is it is now an easy matter to pick up same hole on re-build. We had the same issue with my sons engine, I drilled and reamed for a 3/16" taper pin through the cross head and rod, which has solved the problem. We also found when the engine is not working hard, the HP piston does proportionally more of the work. Because the piston rod is not on the centre line of the cross head this causes the cross head to twist at each change of direction. To solve this we have slotted the slide bar mounting holes and fitted side ways adjusters to the bars, like on a full size SCC, this enables you to adjust the side tolerance between the slide bar and cross head. Since doing the above we have had a no further issues. I'll keep a check on that.